VietNamNet Bridge – While Vietnamese employers and state agencies are struggling with the counterfeit degrees with the stamps of Vietnamese schools, they have been warned that foreign counterfeit degrees have turned up in Vietnam already. A high ranking official of the Ministry of Education and Training said that foreign counterfeit degrees for university and higher education levels have been penetrating into Vietnam through different channels. He admitted that it’s very difficult to discover counterfeit degrees because of the lack of information. One of the best-known organizations which specialize in providing counterfeit degrees is IIU, the International Interacademy Union, which once existed in Russia under the Russian name MMC. MMC was set up in summer 1996. Right after its establishment, MMC “gave birth” to two member organizations named BMAK and BEKK. MMC authorized the two organizations the right to grant the associate doctor degree (equivalent to doctorate in Vietnam), and doctor degree (equivalent to doctor of science in Vietnam) to those, who have demand. Especially, the two organizations have also granted the titles of associate professor and professor, provided the clients pay for the titles and degrees. Meanwhile, Russian authorities have affirmed that BMAK doesn’t have any relations to the Russian Ministry of Education and Science, and that the degrees granted by the organization are not valid. From the day of establishment to the day of its death declaration in Russia, BMAK provided the degrees of higher education to no less than 20 people, not only Russian citizens, but foreigners as well. A counterfeit degree was priced at $6,000. Also according to the official, MMC generated the degrees which were similar to the official degree forms set up by BAK of the Russian Ministry of Education and Science. As realizing that they became the aiming points of the Russian security agencies, MMC has been trying to expand its business to non-Russian markets. Vietnam is one of their targeted destinations. Some Vietnamese citizens, when applying for jobs at enterprises and state agencies, have shown the degrees granted by MMC. The Ministry of Education and Training, in an effort to fight against the foreign sourced counterfeit degrees, has released the Decision No. 77 stipulating the procedures for recognizing the degrees to be granted by foreign training establishments. 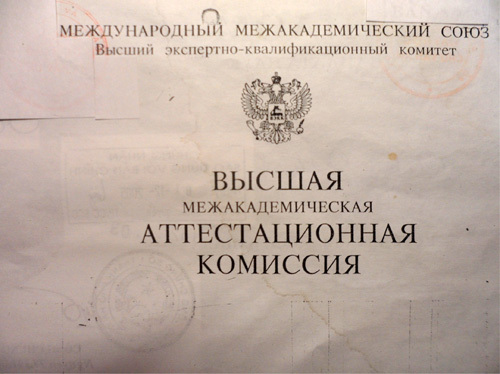 In 2010, the governments of Vietnam and Russia signed a convention on national standard degrees, under which the two parties have to provide to each other all the national standard degrees. However, the problem is that the Ministry of Education and Training of Vietnam and relevant ministries still have not sufficient instruments and the legal framework to prevent and punish those who use foreign sourced counterfeit degrees. If someone is discovered as using counterfeit degrees, he would be forced to resign from the posts, or give warnings, while they would not be prosecuted in criminal cases. The light punishments are believed to “encourage” people to use counterfeit degrees in an attempt to obtain job promotion. Experts have also pointed out that the bad data storage has lent a hand to people to use counterfeit degrees. It’s now necessary to store the list of associate professors, professors and doctors of science for easy reference.